M&M International UK FAQ’s – View answers to some of the most asked questions about Solenoid Valves, Piston Valves and Pressure Switches. Solenoid Valves in particular should not be positioned where they are likely to be affected by water or heavy vapour which will come into contact with the coil terminals. Electrical connections can be made via a suitable DIN Connector and Gasket which will give IP65 protection. Whilst our coils are 100% rated, when used continuously they become very hot and should not be touched. 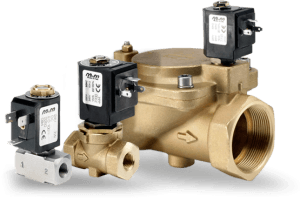 Wherever possible we recommend that Solenoid Valves are positioned in a well ventilated area. When controlling fluids with suspended particulates, we recommend the fitting of a strainer upstream of the valve. Any particulates which find their way into valves may damage the seats and in the case of Solenoid Valves, may impair the movement of internal parts causing malfunction, complete failure or coil burnout. M & M do not recommend the use of PTFE tape when making pipe connections to the valves. Should excess tape be used it can find its way into the valve and, particularly with Solenoid Valves, impair the movement of internal parts or block internal pilot orifices, thereby causing premature failure of the valve. The better solution is a liquid sealant compatible with the media, temperature and valve body materials, or the use of pipe fittings pre-coated with sealant. With the exception of Angle Seat Piston Valves, Flow direction in larger valves is designated by an arrow cast into the valve body. In Direct Acting valves of 2/2 type Flow Direction is generally from port 1 – 2, and in 3/2 types from port 2 – 1. When 3/2 valves are to be used in systems requiring different functions, eg mixing applications, please consult our technical staff who will advise accordingly. Valves should be mounted vertically with the actuator or coil in an upright position. Most M & M valves can be mounted ‘Universally’ but any position other than the recommended may shorten the working life of the valve. All Solenoid Valves should be earthed wherever possible. Earth continuity is maintained from the body of the valve via the coil sleeve which is connected to the earth terminal of the coil. The recommended tightening torque for the coil nuts is 5 Nm. Ensure ‘Good Practice’ when fitting pipework to the valve connections. M & M valves are designed as control valves and should not be used as safety valves in any circumstance. What is the Media and Ambient Temperature? What is the Coil Voltage? It is important that the electrical supply voltage and frequency matches the voltage and frequency required by the coil. If operated within the temperature limits stated and there are no obstructions to the internal parts our valves will operate indefinitely. Solenoid valves are normally fitted with a copper shading ring to reduce vibrations caused by AC voltages. What is the Flow Calculation? Actual Flow is calculated using the kv of a valve (see tables) which gives the flow of 1 litre of water through the valve with a pressure drop of 1 bar at a temperature of 20 oC. Flow values in the specification tables are subject to a tolerance of Â± 15%. Please note that in gas flow, when the Operating Pressure Differential (OPD) is equal to 50% of the inlet pressure, the sonic condition is reached and the flow rate is at a maximum. For correct sizing and to avoid irregular flow rates it is important to note, OPD max <50% P1. What is the Pressure Differential? Pressure values shown in the catalogue are maximum pressures expressed in bar with zero at the outlet. For 3 way solenoid valves the pressure rating can vary when used with different functions or systems. The maximum working pressure (PN) a valve can be subjected to is, in general, equal to 1.5 times the Operating Pressure Differential (OPD). Threaded connections are in Inches GAS (BSP Parallel) and Nominal Diameters or Main Orifice in the valve flowpath, in mm. Are M&M Piston Valves CE approved and do they comply with the European Pressure Equipment Directive? Yes, all M&M products are CE approved and fully comply with 97/23 EC PED. Can I regulate the flow manually on an M&M Piston Valve? Manual flow regulator is another optional extra on M&M Piston Valves. Is it possible to manually override a piston valve? Yes, manual override is an optional extra on M&M Piston Valves. Is it possible to get position feedback on a pneumatic piston valve? Yes, as standard M&M Piston Valves have visual position indication and are available with electrical feedback as an optional extra. What are the standard connections on M&M Piston Valves? The standard ports are from 1/2â to 2âGAS with NPT ports as an option. Air connections are either 1/8âGAS on compact valves or 1/4âGAS on standard valves. Can I use M&M Piston Valves with food stuffs? Yes, M&M Piston Valves are available with weld, clamp (RJT) and flanged connections with 316 stainless steel bodies. How can I prevent water-hammer from occurring? Certain models of Piston Valve are of an anti water-hammer design. Can M&M Piston Valves be operated using any other media than compressed air? Yes, it is often possible to use water or oil if compressed air is not available. Do Ma-Ter manufacture pneumatic pressure switches? 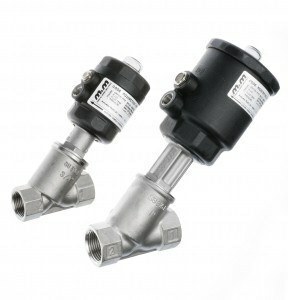 Ma-Ter have recently introduced a range of pressure switches containing pneumatic switches. Are Ma-Ter pressure switches suitable for outdoor use? Mat-Ter switches are available with either a protective cover or protective box, with a protection class of IP65 allowing the pressure switch to be used outdoors. Can I buy Ma-Ter pressure switches pre-set to my specific pressure setting? Are Ma-Ter switches available with a manual reset? 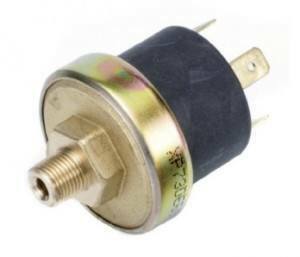 What is the thread type at the bottom of the pressure switch? This is a 1/8â or 1/4â gas thread, available parallel or tapered. NPT is also available on request. What does the Âµ symbol mean that is marked on the body? This indicates the contact gap, which is to be no greater than 1mm. What is the average life expectancy of a Ma-Ter pressure switch?